Are Telefonaktiebolaget LM Ericsson's Growth Days Over? 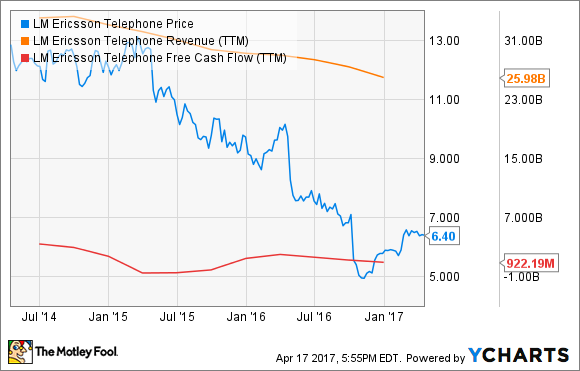 Or can the telecom equipment and services titan come back swinging from this low point in the telecom order cycle? Telefonaktiebolaget LM Ericsson (NASDAQ:ERIC) has seen some hard times lately. The telecommunications equipment and services veteran fell short of Wall Street's earnings estimates in three of the past four quarterly reports, slashed dividend payments by 75% in January, and saw share prices fall 33% over the past 52 weeks. Does Ericsson have a path back to profitable growth, or are the dog days here to stay? 2016 was a tough year for the telecom equipment industry in general. The 4G installation cycle is winding down, and 5G replacements are not quite ready for action yet. Network operators are consolidating on a global level, leaving fewer clients for Ericsson and its rivals to pursue. Economic uncertainties weren't inspiring networks to lighten their capital expense wallets any faster than necessary. All of these issues weighed heavy on Ericsson's sales trends and gross profits last year. The company launched new product platforms while running a cost-reduction program last year. The cost controls are said to be running on track, including the elimination of 4,800 positions or 5% of Ericsson's total workforce. The company recently parted ways with longtime CEO Hans Vestberg, who was replaced by Borje Ekholm -- an electrical engineer with a second degree in economics. Under Ekholm's leadership, 5G technologies will become Ericsson's highest priority, followed by investments in cloud computing and support for the Internet of Things. The recently launched Ericsson Radio System is instrumental to the 5G switch. Supporting radio equipment in a modular design, this platform will be upgradable to 5G standards and beyond. It's smaller and lighter than earlier equipment generations, and should also consume significantly less power. Two-thirds of Ericsson's annual sales stem from software and services these days, up from less than 50% a decade ago. All else being equal, that's a trend toward lower capital costs and wider profit margins. Moreover, it turns out that Vestberg might have more to offer Ericsson even after leaving the company. He now works for Verizon Communications (NYSE:VZ), in a role giving him hands-on control over that network's fiber-optic networking strategy. Ericsson is known to be working with Verizon on infrastructure for the upcoming installation of 5G standards. If that weren't enough, Vestberg is said to have a long-running friendship with Verizon CEO Lowell McAdam, and is one of three high-level executives who might take over when McAdam retires. In other words, Ericsson has a pretty significant foot in the door toward winning contracts for Verizon's network upgrades. Wall Street analysts have started coming around to Ericsson's view, sparking several upgrades and rosy price targets in recent weeks. The company sports an attractive risk/reward balance at today's low share prices, especially if Ekholm can make some tough decisions and take the cost-cutting program to the next level. There ain't no such thing as a free lunch, and Ericsson has a lot of hard work to do before investors can cash in those promises. That being said, we're talking about a global leader in a cyclical but fundamentally strong industry, trading in a deep trough at the moment. I have to say that buying Ericsson today looks less like a risk and more of a value-bounce reward over the next couiple of years.